The ATtiny processors allow you to generate an analogue output using Pulse Width Modulation (PWM). One or more counters in the chip allow you to generate a constant-frequency square wave and specify the proportion of the time it's off and on. 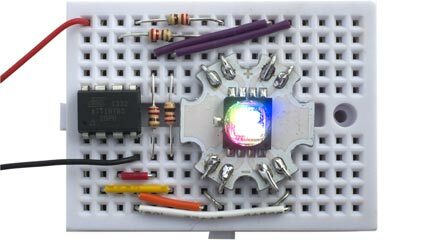 Feed this directly to an LED to change the brightness of the LED, or feed it to a capacitor to generate a variable DC voltage. This article looks at the options for getting PWM outputs from an ATtiny85. The ATtiny85 provides five programmable I/O lines (six if you reprogram the Reset pin), so at first sight it should easily be able to provide the three outputs needed to control an RGB LED. However, things aren't as straightforward as they seem. The standard Arduino core, provided in the Arduino IDE, includes support for the ATtiny85 provided you install appropriate pin definitions . This allows you to use the analogWrite() function to get analogue output on pins PB0 and PB1 using PWM (pulse-width modulation) in Timer/Counter0. First of all, it only provides two PWM channels, whereas we need three to control the RGB light. Although the ATtiny allows you to use PB4 as a PWM output, the standard Arduino core doesn't support this with analogWrite(). Secondly, analogWrite() introduces a glitch into the PWM output. The PWM in Timer/Counter0 varies the pulse width from 1/256 for an input of 0 to 256/256 for an input of 255. However, the code for analogWrite() sets the output LOW when the input value is 0, so there's a discontinuity in the output for values of 0 and 1. We can solve both these problems by programming the ATtiny85 registers directly as described in the next section. Output PB0: OC0A or OC1A. Output PB1: OC0B or OC1A. We've already got OC0A on PB0 and OC0B on PB1. We can get a third PWM output using OC1B on PB4 . Setting the WGM01 and WGM00 bits to 3 selects Fast PWM mode, the same mode as used by analogWrite() on those pins. Setting COM0A0 and COM0B0 to 3 selects an inverted output on PB0 and PB1, so 255 sets the LED off and 0 turns it full on. I used inverted mode because with normal mode a compare value of 0 generates a pulse 1/256 wide, so the LED is never off. For consistency I've also set Timer/Counter1 to inverted mode, so I don't need an if statement in the SetColour routine. There's a bug in current versions of the ATtiny85, and to use inverted mode on OC1B you also have to set COM1A0 to a non-zero value . The ATtiny chip provides two timer/counters, Timer/Counter0 and Timer/Counter1, and each of these provides two PWM comparators, OCR0A, OCR0B, OCR1A, and OCR1B. So in theory we should be able to get four PWM outputs. Why would we want four analogue outputs? One example is to drive the four wheels of a robot. Alternatively, there are very nice high-power RGBW LEDs, which contain an additional white LED. These allow you to create a bright white light with an added proportion of red, green, and/or blue to alter the colour temperature depending on the time of day. But looking at the above table of pin assignments it's clear that we can't get both OC0B and OC1A at the same time, even though there are two pins available: PB2 and PB3. It seems a pity that Atmel didn't include a configuration option for this. We OR the values with the existing value of the register to avoid changing interrupts by the Arduino core functions. The higher the value in OCR1A, the longer the PWM output will stay high before being cleared. This test circuit is only driving each LED at about 20mA, well within the capabilities of the ATtiny85 outputs, although with suitable output drivers and a heatsink this LED can be driven at up to 700mA. 29th March 2015: Corrected a reference to PB2 which should have been PB3. ^ ATtiny microcontroller support for the Arduino IDE on GitHub. ^ ATtiny PWM (updated) on Matt's I Am Nomad blog. ^ Why does COM1A0 need to be set before PWM B will work? on StackExchange. 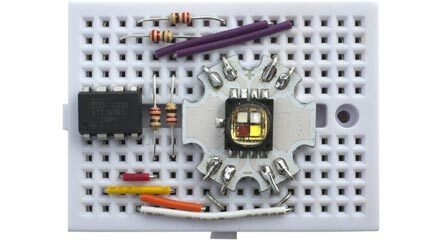 ^ Cree MC-E RGBW LED at LED-Tech.de.